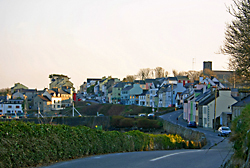 ROUNDSTONE : Beaches, Pubs and Restaurants, Fishing Harbour, Hill Walks, Traditional musical instrument work shop. Highlights: Traditional sailing boat regatta, Macdarra Island Festival, Pony Show, Dog Show. 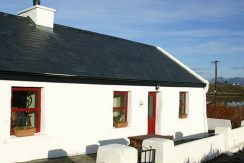 We have some very special holiday cottages in Roundstone. 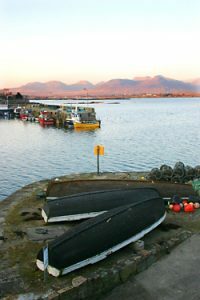 The Village of Roundstone first started to become popular as a holiday destination for people from the east coast of Ireland in the 1960’s and has continued until this day to be very popular and still unspoilt. Many famous people have been associated with Roundstone. Alexander Nimmo, a famous victorian engineer, built the harbour at the request of the fisheries board in 1882. Sting of the 80’s reggae band “The Police” had a property there and Bill Whelan (Riverdance) now resides there. It is not unusual to see members of the Irish Parliament and TV personalities such as Monty Hall who spent many months here filming a TV series in 2010. The village has the atmosphere of a fishing village and still retains its distinct culture as a community in this part of Ireland. Every summer Roundstone Celebrates it marine history by hosting a regatta of traditional work boats of the region these boat are called Hookers, Pucain, and Gleoiteoigs which have been lovingly revived and restored. There is a lot happening in Roundstone throughout the year, as well as the Reggata there is a Connemara Pony, Dog and Sheep show, and in September there is the Marconi Marathon along the bog road towards Clifden. The Roundstone Country Market runs on Sundays 11am-4pm from May to October and is set in the beautiful surroundings of Connemara. Food stalls vary from fresh veg, bread, quiche, eggs, cheeses, oysters, coffee, crepes and BBQ. 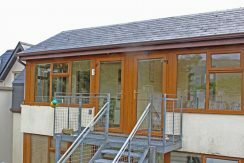 If it’s crafts you’re after you will find wonderful hand-made crafts produced locally including wood products, stained glass, pottery and stone carving as well as beautiful paintings of Roundstone and the surrounding countryside. Visit Michael Killeen Park where you will fine a number of craft workshops one in particular where the owner Malachy Kearnes makes Bodhrans and wooden flutes (bodrahn.com). Botanists will find a number of rare plants in the area of interest including rare heathers which grow nowhere else in Ireland. Stretching inland blanket bog is a site of international scientific interest. Here also there are many lakes where brown trout can be caught.There are a number of great pubs and restaurants catering for all tastes and one is famous for its delicious chowder. Which one? You will have to come here and find out ! A short drive away Ballynahinch Castle Hotel has a salmon fishery and a bar where you can relax in the historic surroundings. Dogs bay and Gorteen are world famous beaches and are close to Roundstone village and is renown for it particularly white sand this beach is very popular with windsurfers dinghy sailors and kite surfers. 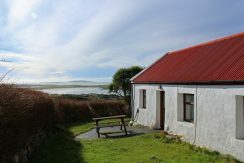 The bay is also a treasured place for geologists and archaeologists alike.If you rent a holiday cottage in Roundstone you are guaranteed a good stay.